This post is the ninth in a weekly series intended to briefly spotlight those things that you need to know about new features in BizTalk Server 2013. A lot of people want to be able to manage BizTalk Server from the command line or from within scripts – it is enterprise level server software after all. In the search for the right tool for the job, it seems most reach for the old stand-by BtsTask utility. Some come to realize that BizTalk Server also has pretty decent WMI support (wrapped around the Microsoft.BizTalk.ExplorerOM.dll assembly). Even fewer realize that BizTalk Server 2013 provides a nice PowerShell alternative (out-of-the-box) to that WMI interface that can be used to fully control your BizTalk installation. In this blog post, we will examine how to make use of that new functionality and we will see how we might also accomplish the same things in BizTalk Server 2010. 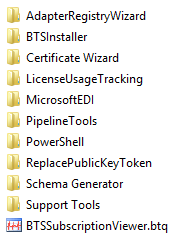 One of those folders recently caught my eye, as it was absent from my BizTalk Server 2010 installations – specifically the PowerShell folder. Inside, one finds that this folder contains the soafactory PowerShell Provider for BizTalk. 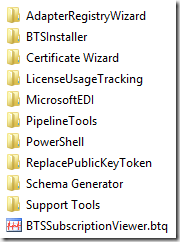 This is actually a project that wasn’t initiated by Microsoft, has some history before BizTalk Server 2013, but has now found its way to be bundled alongside the other Utilities in the SDK – and I couldn’t be happier about that. 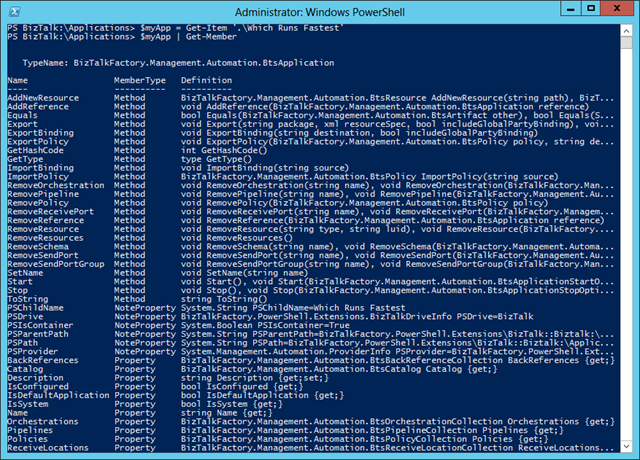 Any time that you add a PowerShell Snap-in, there is actually a relatively easy way to find out what new powers (in the form of cmdlets) that it gave you. 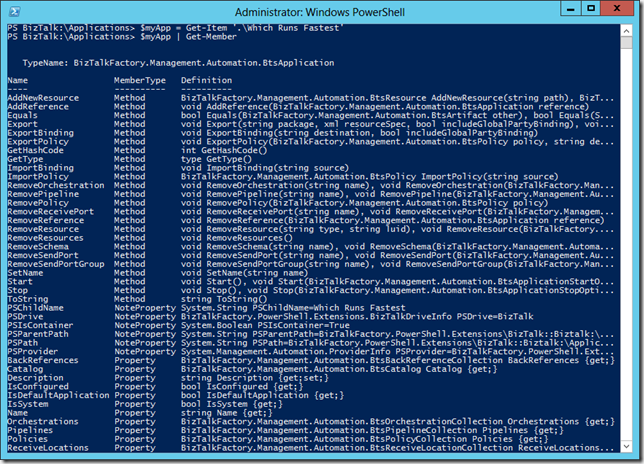 If you’re not familiar fully with PowerShell, each cmdlet returns objects – not just strings of text that spill forth from the console. As a result, we can use a cmdlet called Get-Command to get a list of commands that are available, and then filter that list based on a specific property that each item in the list may have. In this case, the property that we want to filter on is the ModuleName (to see a listing of all the properties we could filter on use Get-Member | Get-Command). 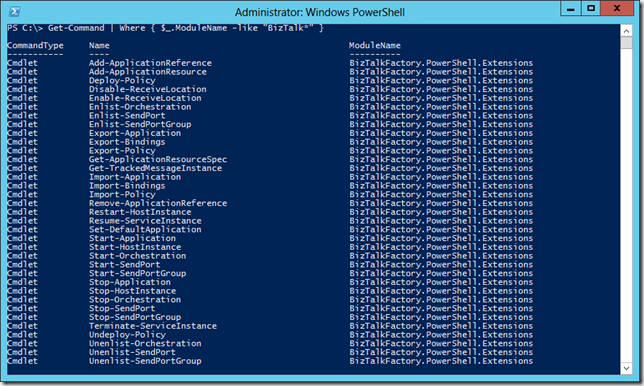 Another interesting thing about PowerShell is the concept of providers themselves. They have the ability to provide visibility into the worlds of specific technologies. To be more specific, consider your hard drive. We think nothing of opening a command prompt and being able to type something like dir to see into that world and retrieve a listing of files. In PowerShell, dir is actually a helpful alias for the Get-ChildItem cmdlet (which is technically, again, returning a listing of objects). Here we told PowerShell to provide us with a table formatted list by enumerating the values returned by that property, and then for the objects returned to show us the value of the FullName and Ports properties on those objects. The sky is the limit though. You have full and scriptable access to the world of BizTalk, and the power of PowerShell at your disposal! Timely post, NIck. Do you know if there are any licensing issues with using the PowerShell scripts in pre-2013 versions of BizTalk. I believe to use the BizTalkExplorerOM.dll, you needed a BizTalk license on the server you’d run your admin tools from (or am I wrong about that? 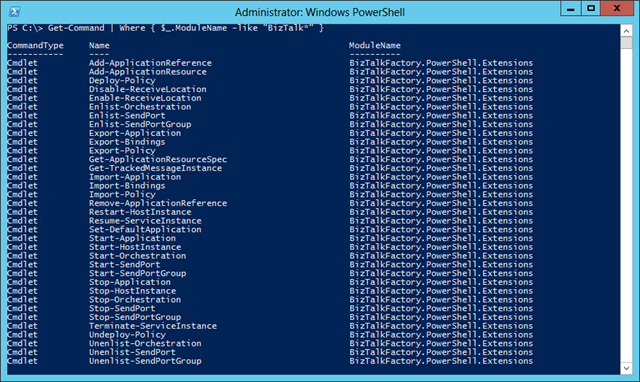 ), so just wondering if there is the same limitation with the PowerShell solution. Thanks!